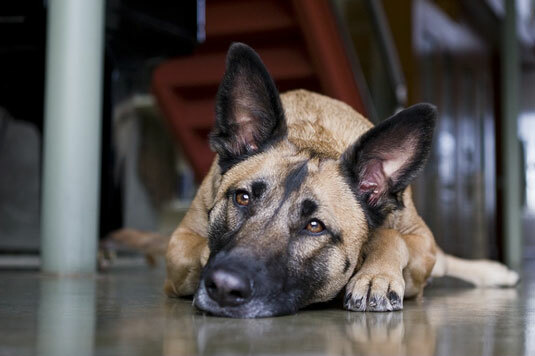 One of the photos you probably want to take is of your dog in a relaxed, resting state. These shots are fairly easy to get, considering the amount of time dogs spend loafing around during the day. Use a zoom lens if you have a light sleeper on your hands; that way, you don’t have to get terribly close. Take advantage of any available natural light! If your subject is sleeping (and theoretically being very still), you can make the most of that natural light by setting long shutter speeds. Just make sure to use a tripod or rest the camera on a stationary object like a book, table, desk, or the floor. 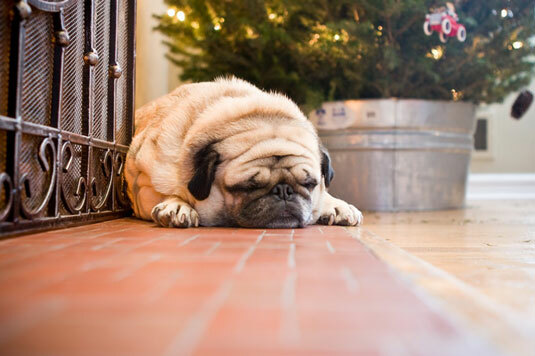 For the shot of Libby here, the photographer caught her snoozing by the fireplace during the holidays. Needing light but without a flash nearby, the best solution for Kim was to sit the camera on the floor and use a long (0.5 second) shutter speed. Because Libby was lying on the floor and Kim wanted the shot to be at Libby’s level, a tripod wasn’t necessary. Wait for your dog to lie down on his own. Position yourself on the floor approximately 10 feet from your dog and zoom in to compose your shot. Give him some time to relax and get comfortable while you set your f-stop to a low number. If you’re using a CDC, set your mode to portrait before you zoom in. When he’s finally relaxed and dozing off, position your AF point over one of his eyes and press the shutter release halfway to lock focus. Quietly and calmly say his name so he opens his eyes without actually lifting his head. When his eyes find your lens, push the shutter release button all the way down without releasing it from the halfway position. Get as many shots as you can, because you may not get another chance! For this shot, the photographer had to put on her patience cap and wait for the shot to unfold. In the meantime, she set the aperture to f/2.8 so the background would turn into nondescript shapes and colors, which draws the eye to the dog’s face instead of what’s happening behind her.